Theater in the Now: Review: When In Doubt, Put On a Musical! Review: When In Doubt, Put On a Musical! A bar is about to be foreclosed so the only logical choice to save it is put on a show. That's the premise of Creative License. With book and lyrics by Kevin Cirone and music by Cirone, Spencer Elliott, and Dan Rodriguez, Creative License is a modern musical with heart. But where there is heart, logic there is not. Cirone’s book follows a very convoluted story. Brothers Jason and Casey need to raise money to save their family bar. Casey gets the idea to put on a play. The catch is his script is on his ex's computer. Bethany hates him and claims she lost all the files so Casey rushes to Bethany’s boss's office and instantly convinces him to allow them to perform his magnum opus. The catch is Dr. Hardy is losing his mind so his opus happens to be the script of a Macbeth adaptation that is coming to town. And things just continue to get wildly and inexplicably complicated. It's always tough when a conflict could be resolved mere moments after it arises, but then where is the fun of a musical? Aside from the plot, Cirone introduces a device at the top and end of the show that never gets used again and could easily be eliminated. Jason serves as a narrator yet he doesn't address the audience again sans the beginning and end. And it's not necessary. Adjusting this could also fix the opening number that wants desperately to be a coherent song where the dialogue breaks are restructured and the music is consistent. The primary plot focuses on Casey and subsequently Bethany. Employees Candace and Perp serve as the cute subplot love story that could be fleshed out stronger. But the character that seems greatly lost is Jason, the role played by author Kevin Cirone. What's absolutely fascinating about the story is both brothers want to save the bar but Cirone is completely inactive in the effort. The characters could be combined and the story would essentially be the same. Discovering the purpose of Jason and a way to make him a more active participant in the story will be of great aid. The score of Creative License has a strong pop rock blend. There are some wonderful numbers, one of which being the bar song "Irish Eyes". This moment showed the bond of the brothers, something that wants to explored further. The team gave a sliver of Macduff, the fake show the characters created. Was the show going to fall into the "Smash" trap and offer something bad they thought was good or The Producers trap where the show is intentionally awful. Creative License went for the latter and left the audience wanting more from this Springtime for Hitler inspired monster. 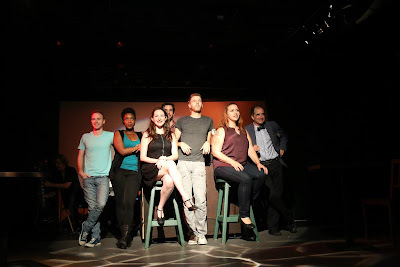 The Boston based musical featured a capable and passionate group of performers. As the guy who can do no right, Michael Leveque had a slacker mentality but fire inside. Levesque's voice has rocker grit that offered flavor to the character. Shonna Cirone as Bethany has a very special theatrical voice and at times it didn't quite match the style of the score. As coworker lovebirds, Maritza Bostic and Jake Alexander were simply adorable. Robert D. Murphy played upon the whacky nature of Dr. Hardy but when he sang “More and More”, it's possible he broke your heart. The smaller venue seemed to work to the production's advantage. Director Rachel Bertone did a fine job with the problematic libretto and keeping it engaging. Without ample wing space, the scenic elements needed to remain on stage throughout but Bertone ensured they remained out of the audiences line of vision. Creative License is a musical about heart and passion and it's certainly filled with it. But at the end of the day, it needs work. Cirone could benefit from taking a step out and seeing the journey from a solely writer's perspective.